Just a quick note to let you know that a fresh new newsletter is coming your way soon! Thank you all who have been writing in requesting more frequently written newsletters. Be on the lookout for the next edition, it is definitely coming sooooon! 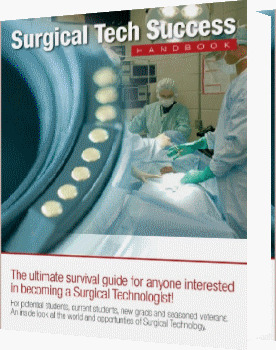 Take a look at the new surgical tech certification study guide that was recently released. The new study guide for the certification exam was written with the recently changed CST exam in mind. AND of course, make sure you give yourself a boost right now and get your copy of the Surgical Tech Success Handbook today. There has been "publisher talk" that the price of the handbook may need to be increased. Of course, my publisher has always told me that I've listed the Surgical Tech Success Handbook far to inexpensively, but as many of you know, I didn't write it to make huge profits, I wrote it to help you succeed! It's just that simple.